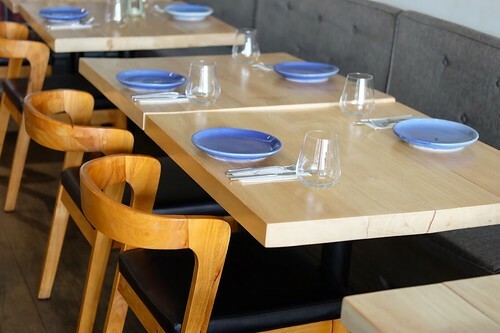 Made Nice Supper Club is a cozy, sophisticated restaurant along Esteban Street Legaspi Village, Makati that offers Western dishes with unmistakably Asian influences. 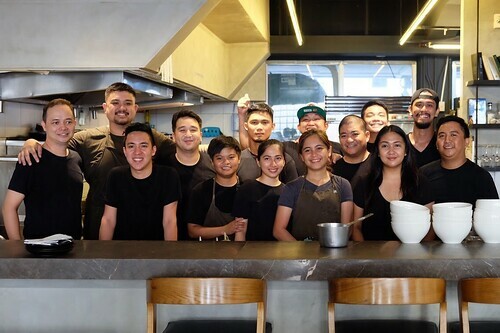 It is by The Greatfull Inc. Group, a group of young talented individual headed by husband and wife tandem Jack Flores and Gabbi Ramos-Flores, together with friends and restaurateurs Wren Go, Aaron Cabagay, Raul Fores and Toby Panlilio. New York-trained Head Chef Jack Fores creates a menu that changes every quarter, taking inspiration from fresh, local, and seasonal ingredients; giving diners an exciting dining experience all year round. 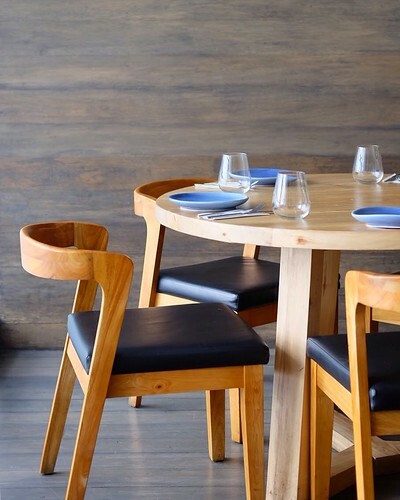 On the outside, the place exudes sophistication with its sleek MN logo and glass panel windows, while inside has a friendly vibe with its wooden tables and chairs as well as a communal dining setup. There is an open kitchen constantly abuzz with activity and a designated pasta corner where you can watch your pasta being kneaded and rolled by hand. It was a bright and sunny weekday, a nice day indeed for exciting news: Made Nice Supper Club is now open for lunch. Initially offering only supper as their name suggests, they are now serving patrons and newcomers for lunch with an equally exciting menu. And we at The Foodie Station got to sample most of their newest offerings, as well as their bestselling dishes. 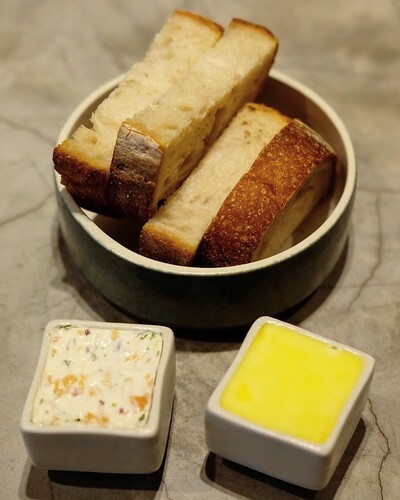 Sourdough bread with just the right crustiness and softness from Toyo Eatery, perfectly paired with a hefty spread of Salmon Cream Cheese + Fresh Butter. MN’s take on the classic Bolognese is something unique. 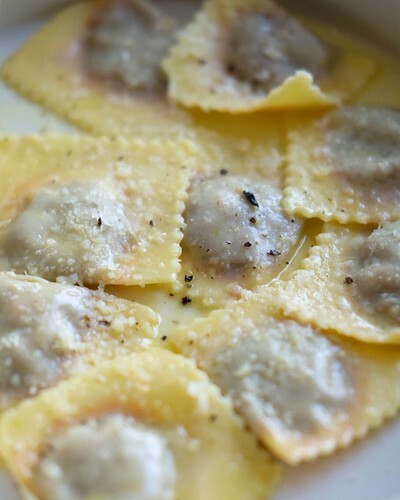 Instead of using pasta noodles, their own mixture of USDA blend of ground meat with tomato sauce is stuffed into little pockets of ravioli. This is then nicely cooked and finished with emmental and gruyere cheese on top. Each bite takes you straight to pasta heaven. 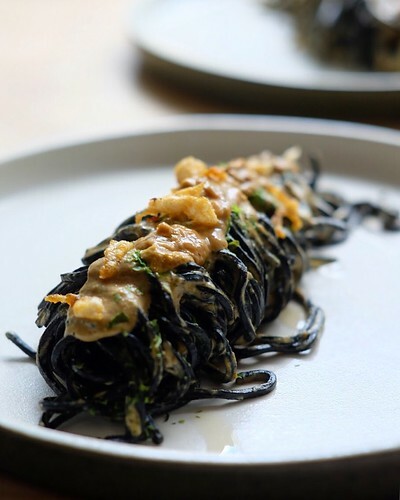 Hand-rolled tagliolini pasta blackened in squid ink, mixed with cream and white wine which gives it a slightly bitter kick, topped with generous amounts of uni. The combination of briny taste and creamy texture is quite strong, but with the right amount of life juice, it’ll work wonders in your mouth. 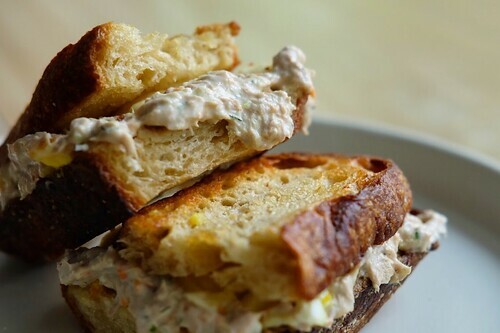 Crusty sourdough sandwich with tuna, egg and fontina which has very tangy taste. A filling meal on its own. Chicken sandwich with mango, coleslaw and fries. 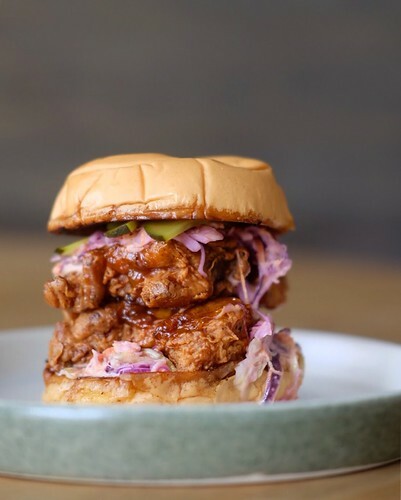 Juicy and soft chicken meat with a refreshingly salty-sweet flavor encased in buttery-soft burger buns. The mango did wonders to the overall taste of the sandwich. And a warning: the fries that come with this is seriously addicting. 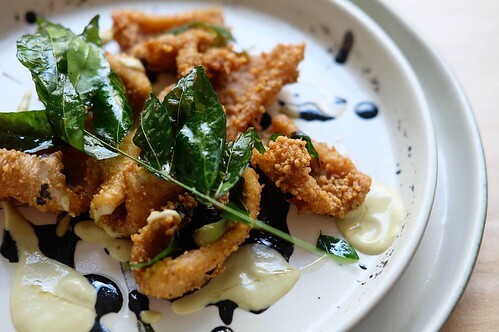 Our beloved Pinoy snack, calamares,beautifully plated for that gourmet feel. MN’s version is topped with curry leaves with various sauces and vinaigrette on the side. 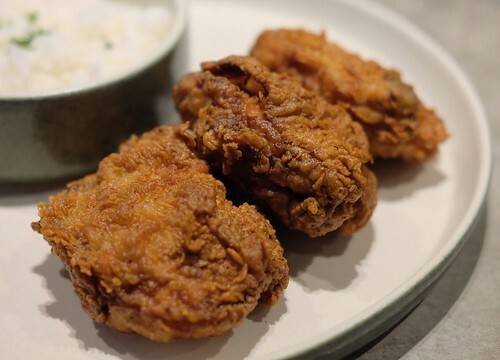 Perfectly deep fried with just the right crispiness on the outside and and tenderness on the inside. This one is a melt-in-your-mouth rice dish. 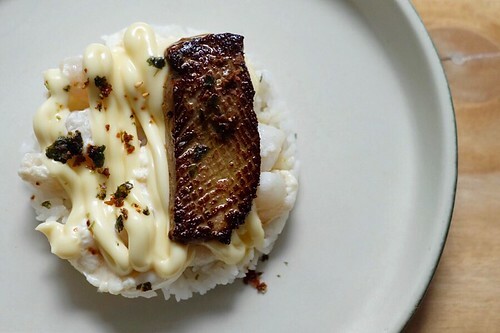 Pan-seared duck liver on a bed of rice, scallops, with egg white mayonnaise and sprinkled with furikake. We loved the creamy and buttery texture with each bite. 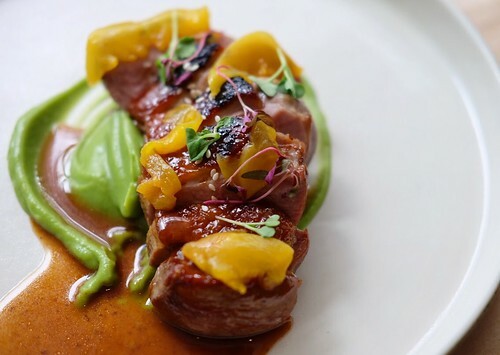 Breast of duck that is cooked medium atop of broccoli puree with peaches and sesame seeds. This dish is definitely a feast for the senses. It has a strong flavor but not too overpowering with a velvety texture that is unlike other red meat. This lunch version of MN’s bestselling chicken dish is perfectly fried, best paired with rice and drizzled with lots of gravy sauce. Crunchy and juicy aptly describes it. This is best eaten hot, so snap a quick photo then dig right into it. do not miss out on this one! This dessert has been a staple on MN’s menu since they opened their doors over a year ago. 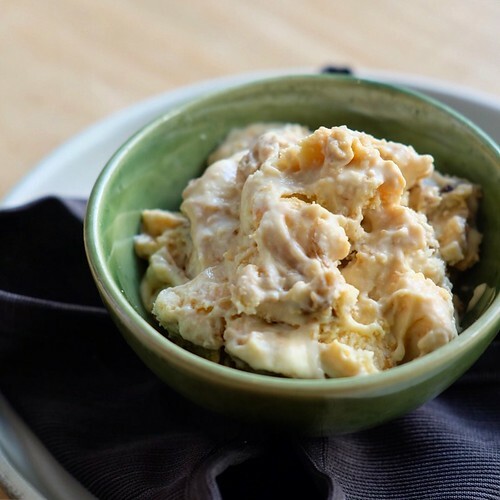 It’s gooey and rich – a crowd favorite with good reason. Made Nice Supper Club definitely offers one of the finest fusion food in the metro. Everything was beautifully presented with careful thought put into each and every dish. Scrumptious without being too overwhelming, and classy without being too loud. A recommended place for brunch with the titas, lunch with the co-workers; and date night with the SO. These mouthwatering offerings are available for the next two months so make sure to catch them! For queries and reservations, drop them a message on Facebook or Instagram. Soon in the PH: Malongo Atelier Barista - French Flavor unlike any other!